Oddly enough, even if banks have set parameters on their mortgage terms and conditions, they are not cast in stone. Many variables contributed to the standard terms and conditions of a mortgage loan but there is still some wiggle space left for a borrower to do some maneuvering and modify certain aspects. 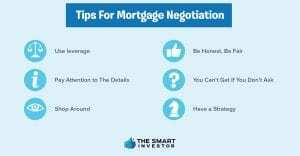 How to Negotiate a Mortgage? So, basically, negotiating a mortgage boils down to three main phases: first is fully understand the current market situation, second would be establishing your goals and third will be the actual negotiation with the lender. There are thousands of financial institutions and companies all over the United States such that in your city alone, you may have hundreds of available choices. These different companies offer a variety of mortgage loans with different terms and conditions – you would hardly find two that are identical. You can expect that their offers would be very diverse and if you intend to get a mortgage or improve on your existing one, your options are far too many. So, what should your focus be as far as gathering the relevant information you need? If you were to rank all the elements of the mortgage according to their importance, the interest rate would probably land in first place. This is something that you should take into account ahead of the other aspects. If you have a variable-rate mortgage, the interest rate will depend upon the FED rates and the margin that the bank will apply. Therefore, your monthly installments will depend on how much interest the bank will charge. Each bank would normally specify the cost of its mortgages through the NIR (Nominal Interest Rate) and the APR (Annual Percentage Rate). These two are the most common measures of the cost of a mortgage. But if you want to compare two lenders side-by-side, you should zero the APR. The APR paints a more accurate picture since this includes the various fees and other costs associated with your mortgage. For opening – Banks charge this fee you first establish a mortgage loan. It will cover the procedures required for its formalization and for sourcing the money to fund the loan. For novation – If ever you want to modify the terms and conditions of your mortgage loan after you have signed it, the bank will have to spend to change them. So, this fee will cover the specific administrative procedures and other related costs. For switching lender – Banks do not generally work with each other because they compete in the same business. So, if you are transferring the mortgage from one bank to another, it will require a series of administrative procedures that will always entail extra costs. Naturally, the bank will have to collect a fee for this. For making early partial/total repayment – Perhaps surprisingly, if you decide to pay back all or some of the outstanding amount of your mortgage loan early, the bank will charge you a fee. This is because if you do so, the bank that financed the operation will no longer receive the interest they were supposed to get for the remainder of the contract. This fee compensates for the lost income of the bank, although some banks do not collect it. For interest rate risk compensation – Banks charge this fee for early repayment of variable-rate mortgages with a revision period of more than 12 months. It will also apply for other mortgages when the market interest rate at the time of repayment dips below the interest rate of the fixed-rate mortgage contract. Banks collect this to compensate for their loss in this scenario. The usual range of this fee is from 1% to 5% of the outstanding amount of the loan. Now get this: when you search for your ideal mortgage, the Internet can be the best place to start. Websites and websites of banks and other lenders await you with their offers – you can even do mortgage comparison online. There are also some specialized publications you can use as references for any uncertainties that you may have. They can complement the websites of the banks to give you a better understanding of the mortgage. Once you’ve cracked the information side, it is time to decide what you want to accomplish when negotiating your mortgage. Since you know what the various banks are offering, you can better plan out realistic objectives that would help you in the negotiation process. Your objectives could vary. You could negotiate a lower interest rate, lower fees, or if you have already contracted the mortgage, a modification of your contract. Your contract may already be in place but if you stumble upon more favorable terms at another bank, you can negotiate to update your contract. How long do you want the repayment period to be? How much interest are you willing to pay? What other associated products do you want to include in the contract? With these items, you can define your own objectives, and then focus on them when you negotiate. We recommend that you try to keep your monthly installments on your mortgage not to go beyond 35% of your disposable income. So let’s get to it: you’ve got to negotiate most of the terms and conditions that will affect your mortgage so that they fit your needs. On top of your agenda should be three important things. The first of them, which is the most important of all, is the margin the bank will use to set your interest rate. Of course, neither you nor the bank can control the Fed rate and it will remain an unpredictable number in a variable-interest mortgage. However, the margin is something you can work with during your negotiation. Think about it: in the grand scheme of things, a small reduction in the margin can make a huge difference in your total loan payment. The second most important aspect is the repayment period of the mortgage. The reality is, choosing a longer repayment period lowers your monthly installment BUT it increases the overall cost of the loan. On the other hand, a shorter repayment period will give you higher monthly installments but your total cost of the loan will be lower. Finally, you should negotiate the various fees and charges that come with the mortgage. Aside from lowering the absolute amounts or rates, you can negotiate to improve some of the terms and conditions. So, there you have it: the big three that you should consider – interest, repayment period, and fees. Try to work together with the bank on these items so you can get a much fairer deal. You must admit: your negotiating advantage is proportionate to the size of your mortgage. For example, if you have a $400,000 mortgage, you can bargain for a lot more favors because from the lender’s end, they stand to get a lot bigger profit from your loan. Beyond that, if you are employing a mortgage broker, you can ask him to slash off a few hundred dollars from his commission when it’s a big mortgage that’s involved. They will still earn a hefty amount and of course, they want your business. Here’s how ridiculously easy it is for some lenders to earn from your loan: fine prints. You might fall into thinking that you are going to save money because of low interest but it’s the fine prints that will kill you. Low rates often come with hidden charges you don’t notice on the parts of the agreement that you don’t read. Since most lenders now post their rates on their websites and they know that most borrowers check out the rates first, they have already lowered their rates. However, to make up for this, they’ve added some details to the contract. Therefore, don’t just look at the actual number but ask about the product terms and conditions. What prepayment options will you have? Is it possible to port your mortgage at all? Will you have to pay penalties in case you need to move or break the mortgage contract? And yes, do they charge transfer fees at all? Setting those issues aside, there’s nothing better than actually shopping around for the best mortgage rate and terms. Do not just stick to your local bank. It may be unthinkable but a good number of Americans obtain just a single mortgage quote before they sign. Would you follow the same practice if you were looking for a cheap plane ticket or buying a new car? That would be next to foolish. Without arming yourself with multiple offers, it will be much more difficult to negotiate for a lower rate. This calls for talking with a few local banks and credit unions, one or two mortgage brokers who can canvass for your rates from multiple lenders. Once you’ve got these rate quotes in hand, you can put closing costs and associated terms side by side and pit them against each other. Pretty soon, someone’s bound to come to offer you a better rate. Don’t forget to shop around for homeowner’s insurance and title insurance because banks and other lenders would usually recommend them. Remember: don’t take anybody’s word for something to be the best deal for you – do some legwork and get proof. Lying, as a negotiating strategy, will likely backfire on you. Do not say that Mr. Smith down the street is giving you an insanely low rate (when he’s not) in an attempt to cause the agent to lower his quote. In all likelihood, the mortgage specialist will know that you are fibbing and this will cause a crack in the relationship you are just beginning to build. Look at it this way: if your agent already offered to pay your legal and transfer fees, but their best rate is still 10 basis points higher than the lowest in the market, do you think they can still go lower? Likewise, if you’ve just come out of bankruptcy or have bad credit, you don’t have much bargaining advantage and very little leverage. But this shouldn’t stop you from trying to get a good deal! If you don’t fully understand some of the mortgage terminologies or if something causes confusion to you, don’t hesitate to ask. In all probability, your agent has heard the question 100 times before and they’ll be more than willing to give you an easier explanation. You should ask your agent about additional offers and bonuses. You might find agents (but not all) who will be willing to pay your legal fees and appraisal fees to get your business. If you put these small gains together, they can add up to hundreds of dollars in savings. This area is probably where the mortgage broker would prove really valuable. To begin with, you have to remember that they get their salaries from the financial institutions and not from you. Therefore, they will make sure that their employers get the longer end of the stick. Educate yourself regarding the mortgage basics. Read up and know how a fixed-rate mortgage compares with a variable-rate one or what’s the difference between a closed and open mortgage. It may sound like a good idea at first, but don’t take a five-year-fixed mortgage automatically. Look into the various terms that are available for you. The bottom line is this: the mortgage lending market is extremely competitive and lenders will fight tooth and nail for the business of first-time buyers. On top of that, the recent slowdown in home sales has put enormous pressure on lenders to reach their quotas of acquiring new business.